While decorating with colour is a reflection of your own personal style, it can also be used to enhance the mood of a room. Do you want to add excitement to your dining room? Maybe create your own bedroom oasis? How about designing a welcoming living room? Whatever you picture your home to be, the use of colour can help you achieve your goals. 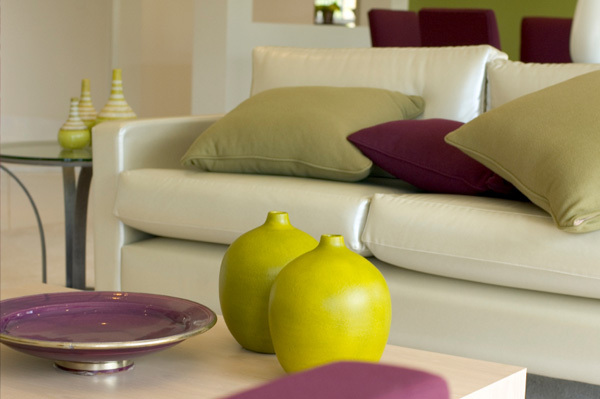 Colour is known to dramatically affect moods and can be used as a tool to help create the home you desire. Consider using these colours for their mood boosting properties. Yellow is known to stimulate the intellect. It helps grab your attention and stay focused. This boost of colour is helpful in an office or other designated study space as it keeps the mind alert. Soft yellow can be great for an active room such as family or play room as it has a warm cozy appeal. Red is considered an exciting and energiziing colour. It’s popular in dining rooms and restaurants as this powerful colour can stimulate an appetite. It will also help incite feelings of passion, sexuality and intimacy. Orange is a welcoming hue that gently warms up a room. It can add a fun social appeal to any room so is perfect for living or family spaces. It may also stimulate creativity so is a nice choice for any activity area. This is a tranquilizing colour that’s known to be soothing and nurturing. It helps create a calming enviroment filled with feelings of unconditional love. It’s a great choice for a child’s bedroom. Blue has a calming affect on the mind and body that makes it an ideal choice for bedrooms or other quiet spaces. It lowers blood pressure so it is considered a colour of relaxing and healing but is also known as an appetite suppressant. This is another great colour to help calm the mind. It’s know to be a hue that may purify and help with meditation as it heightens our self awareness. A good choice for bedrooms or meditation areas. Green is the colour most associated with nature and as such can be used almost anywhere in the home. This colour promotes harmony and balance. Lighter greens are nice in a bathroom or bedroom while deeper greens work in living rooms or kitchens. This colour encourages communication and helps create a peaceful space by helping to reduce negative feelings. It’s good for the immune system and may help fight depression. This colour will work everywhere in the home except for areas of high activity or studies. This colour represents purity and light. While this colour can make your space appear larger it can also come off as sterile. This colour can work anywhere in your home as a base to work with the accesories in your mood enhancing colour. When black is combined with another colour it works to enhance the mood of that colour. It also helps allow for the space required for personal reflection. It will add weight to a room when used in conjuction with other colours. Use in whichever room you choose.